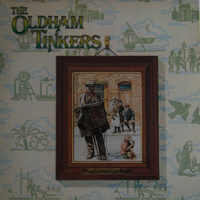 The Oldham Tinkers from South Lancashire made their recording debut on the best selling ‘Deep Lancashire’ collection in 1968. Throughout the next decade they took their music to a wide international audience. Their fifth ‘solo’ album for the Topic label is another powerful mixture of Lancashire humour and pathos. Their beguiling songs are derived from the poems of local dialect writers, from Music Hall entertainers and from the traditional music of the North West of England.